For those individuals who have fear or are nervous towards any type of dental treatment, there are a couple options we offer at Westview Dental to help alleviate some of your anxiety. Nitrous Oxide: is a safe and effective sedative agent that is mixed with oxygen and inhaled through a small mask that fits over your nose to help you relax.Nitrous oxide, is also called “laughing gas,” is an option your Dentist may offer to help make you or your children more comfortable during certain procedures. This can be used for any treatment, with local anesthesia, from Fillings to Crown Preparations, as well as implants or extractions. Oral sedation:This refers to taking prescribed medication an hour or so before a dental appointment for a calming effect. Oral sedatives can be taken with or without the use of nitrous oxide and local anesthesia. 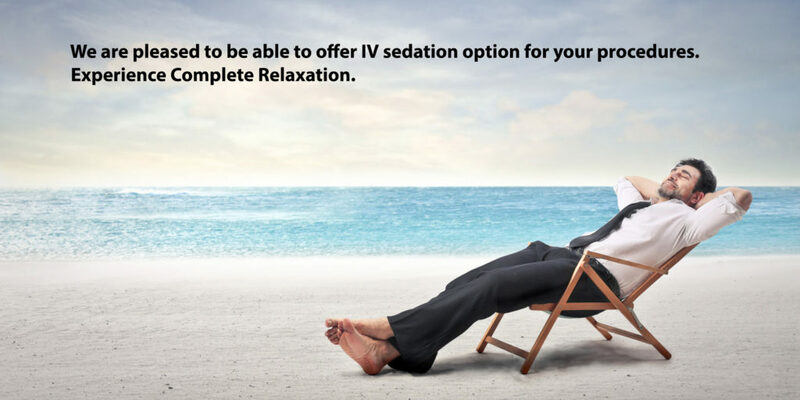 IV or intravenous (“intra” – inside; “venous” – vein) sedation.This is the next level of sedation administered if oral sedation is not enough to facilitate needed dental treatment. In this case, the sedative medication is delivered through a small needle or catheter placed in a vein. Generally this is for more surgical procedures such as Wisdom tooth removals, Bone Grafts, or Implants. Lastly, it is important to find the right, compassionate healthcare provider. This is important for everyone, especially for individuals who are particularly anxious. Your dentist should always listen carefully to you in an accepting and non-judgmental way, and offer assurances that you are in control of the situation at all times. Next Post:How do I get a Celebrity Smile?